Scrapping Illinois’ flat income tax protection would open the door for massive tax hikes on the state’s middle class. In a major victory for Illinois taxpayers, a progressive-tax constitutional amendment did not make its way out of Springfield this year. But what Illinoisans may have missed is that the House of Representatives voted in favor of a progressive income tax resolution on May 29, just two days before the end of legislative session. House members voted 61-52 to pass House Resolution 1025, filed by House Speaker Mike Madigan, declaring their endorsement of a progressive income tax. While nonbinding, the resolution puts on record the House Democratic majority’s desire to scrap the state’s constitutionally protected flat tax and replace it with a graduated, or progressive, income tax system. In the district of every representative who voted in favor of Madigan’s progressive tax resolution, the tax rates proposed in the FRIENDLY Act – the only progressive tax bill in Illinois including a rate structure – would hike taxes on the median household. 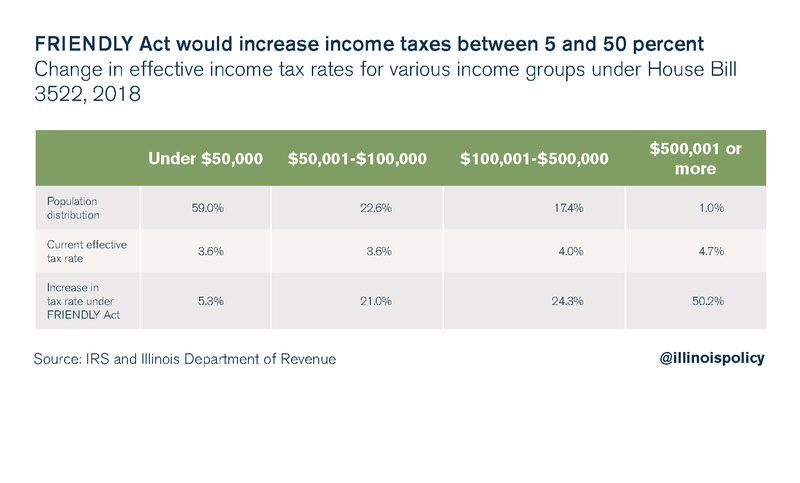 While removing Illinois’ flat income tax protection would first require amending the state constitution, the vast majority of Illinoisans would see their income taxes hiked under this progressive income tax plan. The median household in all 118 Illinois House districts would see their income tax bill rise under the rates proposed in the FRIENDLY Act, including in all 61 districts represented by a lawmaker who supported Madigan’s progressive tax resolution. The median household in the 18th House District would see its income tax bill increase by $864, a 22 percent hike. Aside from the income Illinois households would lose under the rates in the FRIENDLY Act, a progressive tax could also inflict significant damage on Illinois’ fragile economy. Economists agree that tax hikes reduce economic activity. Because tax increases have negative impacts on private investment, even a temporary tax increase has a very large and sustained negative effect on the economy. Furthermore, the combination of tax increases and increases in government spending have a negative impact on investment. A proposal to raise taxes – which is what a progressive tax at FRIENDLY Act rates would do – makes no sense given Illinois’ relative economic sluggishness. Moreover, there is also a substantial amount of literature that provides insight into the potential effects of enacting a progressive income tax. Proponents of the progressive income tax argue that because it is designed to reduce the tax burden of those with a lower ability to pay by shifting the burden to those with a higher ability to pay, an increase in tax progressivity will go a long way in reducing income inequality and could be a net benefit to the economy. However, economists widely agree that more progressive tax systems have negative effects on economic growth. And the link between tax progressivity and income inequality hasn’t been established. States with progressive income taxes are home to higher income inequality and saw faster growth in inequality from 2006 to 2016. Some experts have found that a shift to higher tax progressivity has negative effects on economic growth while still increasing income inequality. This is because progressive taxation decreases the incentive to acquire new skills or more education, which increase lifetime earning potential. Meanwhile, the transition to a less progressive tax system or a flat tax system gives rise to increased economic opportunity, less income inequality and greater upward mobility in the long run. Other experts have found that income inequality could be reduced by enacting a progressive income tax, but that this would come in exchange for a large decline in living standards. Although some studies have found that income inequality could be reduced in a progressive tax regime, this could come at the expense of lower standards of living for everyone. Taken together, higher top marginal tax rates seem more effective at reducing economic growth than at reducing the degree of long-run income inequality. A progressive income tax is a wolf in sheep’s clothing. While its proponents claim it would merely make the rich “pay their fair share,” a progressive tax would result in tax hikes on middle-class taxpayers. Given the negative effects of higher taxes and tax progressivity on economic growth – and Springfield’s insatiable appetite for spending beyond taxpayers’ means – a progressive income tax is likely to cost the state billions of dollars in forgone economic activity and tens of thousands of potential job opportunities. Instead, lawmakers must look to rein in the growth in state spending. Their lack of discipline has forced tax hikes, unsustainable debt and enormous uncertainty in the private sector over the future of Illinois. Rather than introducing more uncertainty with a progressive income tax system, lawmakers should adopt a spending cap that ties state spending growth to growth in Illinois’ economy. Illinoisans could then rest assured they’re getting a state government they can afford.